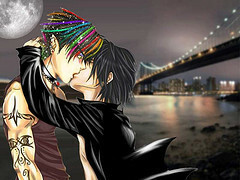 Alec & Magnus Kiss. . Wallpaper and background images in the Alec & Magnus club tagged: kiss alec magnus city of bones. This Alec & Magnus fan art might contain quartier des affaires, le centre-ville, centre d'affaires, and au centre-ville. Cute. Best couple. And I have read a lot of romance books, but suprisingly Magnus and Alec are the best in my eyes. I love it! These two are the best couple I've seen!!! yours pics of magnus (and alec) are the best i could find at google. or maybe the ones who were the most like my imagination. There are not words to describe how much I love it.